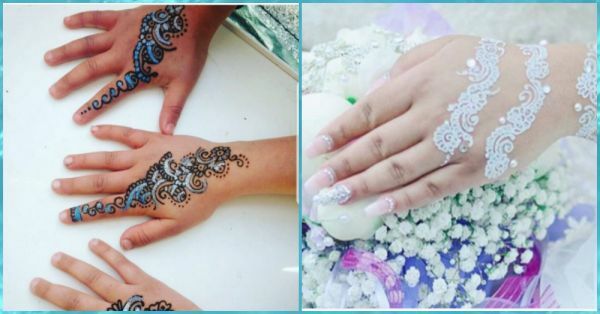 Will You Try This New *Glitter* Mehendi At Your Shaadi? Your wedding mehendi is one of the most pious rituals that is not only enjoyable, but also very memorable. While the traditional green henna always tops the score, it is always fun to try on something different. Whether you’re going in for a minimalistic dash of glimmer or an all-around glitter mehendi design, this is one trend that’ll leave you awestruck! Bookmark this story if you must, as we are going to unleash some awesome glitter mehendi designs that’ll surely make you sit up and take notice! If you’re the bride who prefers a full-blown glitter mehendi pattern and is not afraid to experiment with funky colours, then these mehendi designs would be perfect. The rainbow glitter mehendi and the fully bejewelled mehendi design would work well with a minimalistic outfit or a monochrome lehenga. If you’re wearing a heavily embellished outfit, you can sober down the look with a minimalistic mehendi design. An Arabic print mehendi or shimmery white henna will really look great. Also, make sure that you let your mehendi dry completely so that the glitter doesn’t stick elsewhere or gets messy. So, what do you think about this shimmer trend? Would you try it out? Let us know!